According to reports, the BJP has agreed to offer Ram Vilas Paswan’s LJP six Lok Sabha seats and one Rajya Sabha seat. New Delhi: The Bharatiya Janata Party (BJP) seems to have found a way to placate Lok Janshakti Party (LJP) which has been sulking over the seat sharing in Bihar NDA for the 2019 Lok Sabha elections. 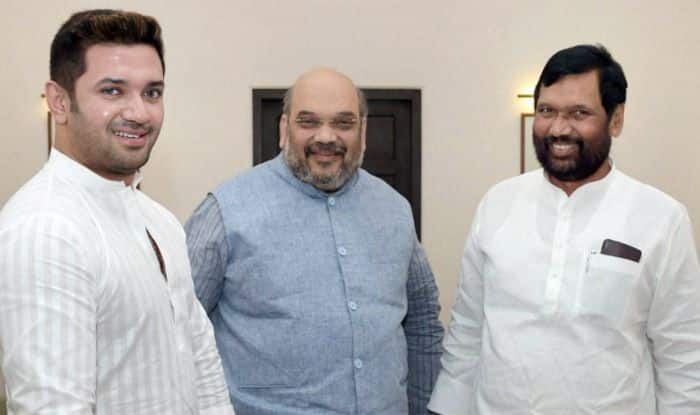 The BJP is believed to have reached a seat-sharing deal for the 2019 Lok Sabha polls, offering Ram Vilas Paswan’s LJP six Lok Sabha seats and one Rajya Sabha seat, while the JD(U) and the saffron party itself will contest on 17 seats each in the 40-member Bihar Assembly. However, it is believed that it was not the Lok Sabha seats but the one Rajya Sabha seat promised to LJP by the BJP months ago that had left Paswan discontent. The development comes after the Union minister and his son Chirag met Finance Minister Arun Jaitley on Friday to discuss the contentious issue of seat sharing in Bihar. After the meeting with Jaitley, LJP Parliamentary Board Chairman Chirag Paswan expressed the hope that talks would move in the right direction. “Talks are going on. An announcement will be made at an appropriate time. We have put our points before the BJP leadership and the important thing is that we are being heard. Hope everything will be fine,” he told reporters. His uncle, Ram Chandra Paswan, who also attended the meeting said that the LJP would remain part of the NDA. “We are and will remain in the NDA. Seat sharing will be announced this week,” Ram Chandra Paswan said. “The party, which is having strongholds in any specific area, should be respected. We are a small party. We need adequate time for preparation. That’s why we wanted the issue to be resolved at the earliest,” he told reporters. An hour-long meeting between Paswan and his son Chirag, and BJP president Amit Shah and Jaitley on Thursday had remained inconclusive. Following the BJP’s recent defeat in assembly polls in Chhattisgarh, Rajasthan and Madhya Pradesh, the remaining two NDA constituents in Bihar have flexed their muscles. It is believed that it was not the Lok Sabha seats but the one Rajya Sabha seat promised by the BJP months ago that had left Paswan discontent. Paswan had given the BJP an ultimatum of December 31 to finalise the seat-sharing scheme for Bihar. With RLSP's exit, the NDA in Bihar is now left with the LJP and Chief Minister Nitish Kumar’s JD(U).